(2017-03-31, 15:12)DaveBlake Wrote: I will be deleting posts and editing etc., so do not take offense if that happens to your post. Just a heads up that as of June 14th, Leia changed the way addon settings are handled, so the DialogAddonSettings will be unusable for any body that is using your test build with a skin that has been updated to reflect that change. See 2603091 (post). Thanks Bart for the heads up on addons. This greatly reduces the 503 errors or gaps in results when scraping artists or albums (only global server issues should cause failures). Useful testing for me would be if some of you could do a clean install (use portable mode so your setup is not effected) and try out adding a music source with "Fetch additional info on update" enabled so that scraping happens immediately after scanning. Use the latest versions of the Universal album and artist scrapers please too. Done a tidy up, split off scraping phase #1 changes testing feedback and questions to Testing scraping changes and feedback Thanks to those involved. This is now merged into the current nightly. Going to want testers, anyone want to be selective about which parts of their music collection they scrape additional data for and where it comes from? The old functionality was so broken I doubt it was used. Thank you for this!!! I have been using it extensively in the last couple of days. I scanned my whole library again into Kodi (226k songs, 2800+ album artists, 16k+ albums), and the album artist count was what I expected. I started working with artists, and, as expected, a lot were not found by Universal Artist Scraper. So, for a lot of artists where I do have an NFO with appropriate information (including MBID for the most part), and a thumb and fanart, I changed the local provider and refreshed, getting just what I wanted. I did this for individual artists first, and then set local provider as default and refreshed all artists. The results were as expected, so this is working fine! It will take me a while, though, to get every single one of my album artists to show info and images. I will chip away at it slowly, but surely. Most recent test build is KodiSetup-20171025-d3186d58ff-ProviderDialog-x64.exe - link is Win64 but other platforms on mirrors accordingly. see 319284 (thread) for full discussion and any feedback please. It also has a improved add music work flow/UI by making the default scraper settings available from the "add to library" prompt. Similar settings dialog is used from "Change Information provider" on context menu for artists or albums nodes, replacing the intermediate sub-menu I added earier in v18 with selection list on the dialog itself. Just adding this info/request from the Artwork Beef Add-on thread regarding the new artwork types for music to bring it up to feature parity with Movies and TVShows. Quote: Just out of interest, what artwork features are you missing from the music library support? Quote: That PR only applies to scrapers/information providers and library imports. JSON-RPC can only get fanart and thumb for artists, and can't set any artwork in the music library at all (artists or albums), so Artwork Beef can do nothing (JSON-RPC is the only sanctioned way for it to interact with the library). 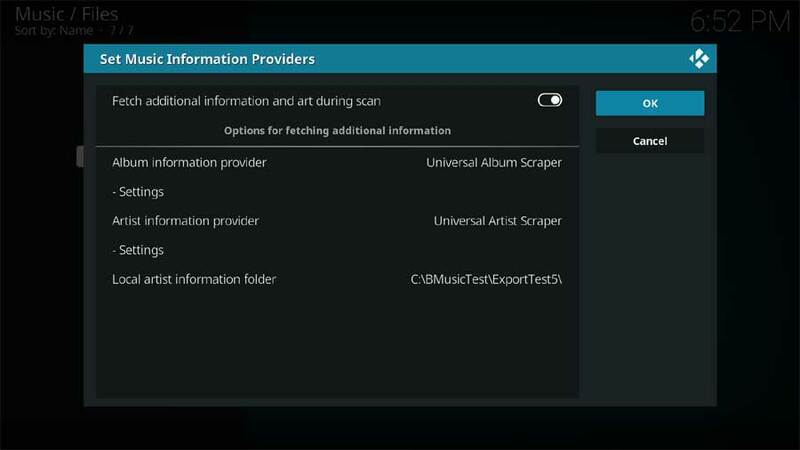 Additionally, Kodi needs a "Choose art" option in the GUI so users can set extended artwork manually, for both artists and albums at least. Music library extended artwork support works like charm...no isue, and is faast for art changing. This is view for content Album. In first column are Title for album in second are AlbumTitle for that Artist. 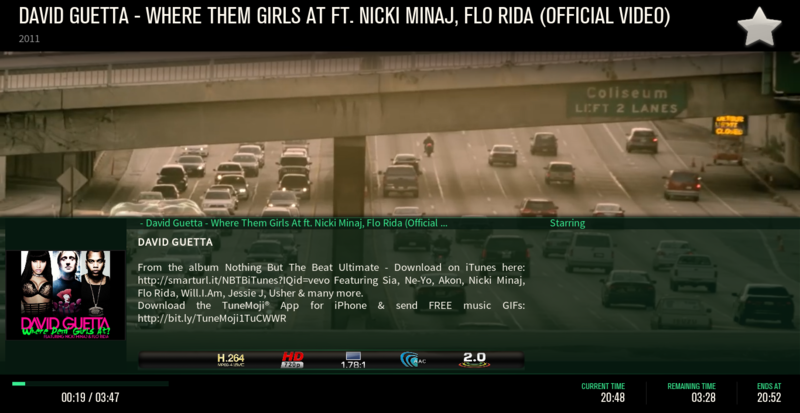 This code find all album for that Album Artist, and i can with single click to play whole Album song from same Artist. - Have you think to add somthing like "trailer" for music...? I add in Marcel script "youtube.track" from Zag (@docwra ) theAudioDB.Working almost perfect ( have problem with contry region playing-can't play some videos). Just done a much overdue thread tidy-up, and update of first post. The done list is growing in length, but the todo and in-progress not getting any shorter!!! Most recent test build is 20180415-bc197eda-PR13769 - link is Win64, OSX build also on the mirrors, please ask (in this thread) for any other platform. See 330961 (thread) for full discussion and any feedback please. New option to prefer online album art over the art embedded in music file as provided by PR13812 has now merged 29/04/2018 and will be in the next nightly build. See 331191 (thread) for fuller description. Local album covers will continue as before to take precedence over both scrapped and embedded covers. Make automatic fetching of any type of local artist and album art configurable (rather than hard coded) via a white list of art types (matching filename) PR13848. Skinners and art fetching addon authors need to work together as a community to decide what common art types they will support, but this no longer needs any core changes to Kodi itself. For v18 this is an expert user feature rather than something I expect every user to master, but I hope configuration will eventually become part of skin/addon setup. 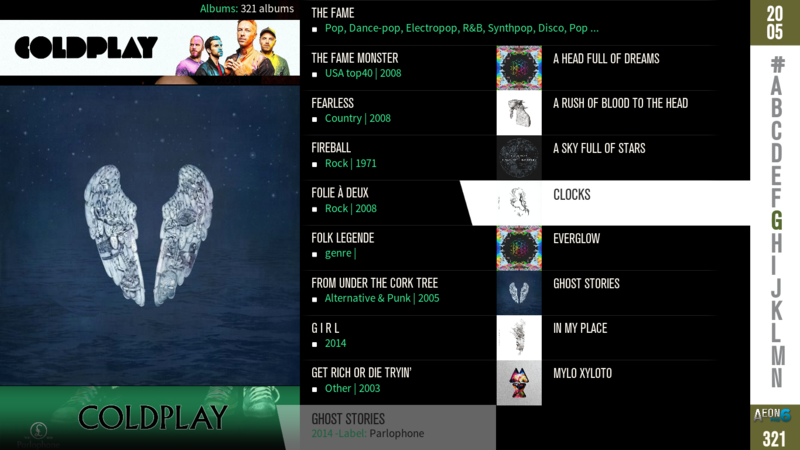 Add music library facility to filter artists, albums and songs by media source. PR14012. This is something for users, especially those with large and diverse music collections (like mine). 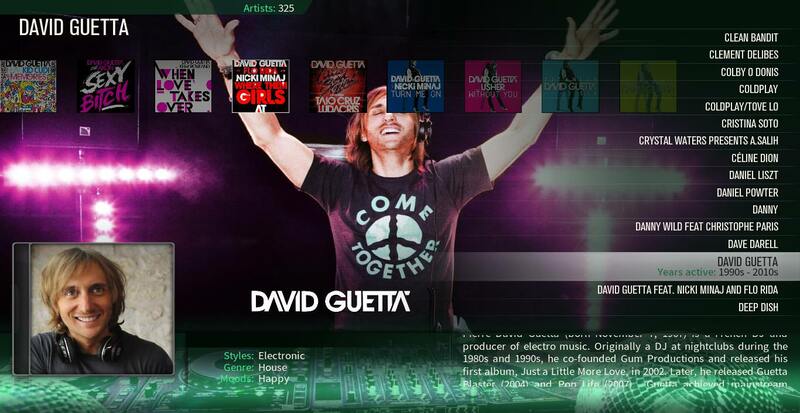 It is very natural to categorise music by putting it under separate folders, and in v18 with the introduction of the Artist Information Folder, users can arrange their music files into whatever folders they like (there is no longer any need to try to have all the music by an artist, and only that artist, under one unique folder in order to have local art and artist.nfo files). So say you arrange your music into folders they like e.g. "Opera", "Kids stuff", "Party Music", "Top Jazz Music", "Why did I buy this" etc. , then by simply adding these as separate sources (via the media source dialog), filtering based on source is available from the side blade filter and smart playlist/custom node rules. An internal reworking of the batch access to song, album and artist data via JSON API has made it significantly faster (~ 5 times depending on the data requested). PR14160 This makes apps such as Yatse and Kore, that fetch music data in batches, much faster to sync. See pull requests for more details. I also fixed some bugs along the way - a devs work is never done.